SPURS TICKETS SEASON 2018/2019 Tottenham Hotspur Football Club is one of the top London football clubs. The club enjoys an intense, long-standing rivalry with near neighbours Arsenal. 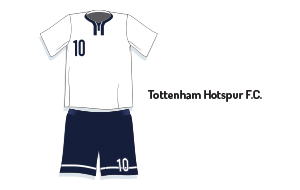 The Spurs achieved an impressive third place last season, behind both Manchester clubs. Tottenham have also qualified for the 2018-2019 UEFA Champions League season. Managed by Mauricio Pochettino and playing attractive football with world-class players such as Kane, Eriksen, Dele Alli, Lamela and others, Tottenham is a serious contender for the 2018/2019 Premier League title. Buy Tottenham Hotspur tickets now. 1st4 Football Tickets can provide you with Tottenham tickets to all Premiership matches including Tottenham Hotspur top matches. Tottenham vs Chelsea - Tottenham vs Arsenal - Tottenham vs Manchester United - Tottenham vs Liverpool - Buy your tickets for Tottenham through our safe booking system.